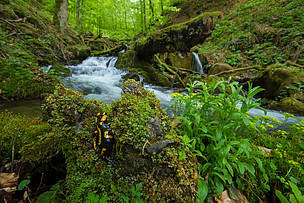 Lviv – New evaluations estimated more than 6,000 ha of potential virgin forests and old-growth forests in Ukraine. These areas were nominated as an extension of the UNESCO’s World Heritage Property “Primeval Beech Forests of the Carpathians and other regions of Europe” in Ukraine. In October this year, a representative of the International Union for Conservation of Nature (IUCN) – Ms. Kumiko Yoneda, visited the five proposed areas to verify the nomination submitted to UNESCO. The decision whether these areas will be designated to the UNESCO’s World Heritage will be taken in June 2017.The old-growth forests are located in the Carpathian and Podolsky region of Ukraine (the Transcarpathian, Ivano-Frankivsk, Lviv and Khmelnytsky regions). These areas are part of National Parks “Synevir”,”Zacharovanii Krai”, “Podolski Tovtry” and within the nature reserve “Gorgani” and “Raztochia”. This is one of the final stages of the expansion of the World Natural Heritage areas in Ukraine. The proposal is a result of joint efforts and collaboration between the Ministry of Environment in Ukraine and WWF-Ukraine.23,510 ha of virgin forest in Ukraine are already protected by UNESCOCurrently, 23,510 ha of virgin and qvasi-virgin forest in Ukraine are included in the World Heritage Property “Primeval Beech forests of the Carpathians (Slovak Republic and Romania) and the Ancient Beech forests of Germany”. This additional 26% to the existing areas is only a small piece of the virgin and old growth forests that can get the highest international recognition.“According to our preliminary estimates, the territories with old-growth forests in the Carpathians are about 80,000 ha and the protected areas are only 4% of the forests. Their number is constantly decreasing. Over the past 25 years we have lost at least 100,000 ha of forests only in the Carpathians. The obligations to keep the Ukrainian virgin areas protected were supported with ratification of several international conventions, including the Carpathian Convention. The critical importance of the virgin and old growth forests should not be underestimated, they are a museum of nature, have a genetic value for the future of the forest areas and are living cells of a large number of rare species of animals, plants and fungi”, said Bogdan Prots, Coordinator of the WWF-Ukraine Conservation Work.Virgin forests nominations to UNESCO in Romania and BulgariaNew evaluations in Romania estimated over 100,000 ha of potential virgin forests and over 20,000 ha have been nominated as an extension of the World Heritage Property. The following regions are included: Maramures, Brasov, Valcea, and Caras-Severin. The decisions whether these areas will be designated to the UNESCO’s World Heritage will be taken in May 2017.In Bulgaria, beech forest areas in the National Park “Centralen Balkan” were nominated to be included to the UNESCO’s beech forests sites at the beginning of 2016. The government gave approval of Bulgaria’s application after it was supported by local communities. In October this year, field evaluations were made to identify the proposed areas and the final decision will be taken in 2017.